In reference to wine making, "pulp" refers to the flesh of the grape. The pulp contains a majority of the water, sugar, and acid that forms the grape juice extracted from the grapes. 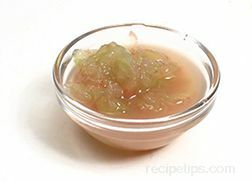 The pulp is typically dull gray or pale green in color, regardless of the skin color of the grape.